Over the past decade homeschoolers have finally come into the recognition that they deserve. Individuals, colleges, universities, and even employers have begun to realize that homeschoolers are typically more mature, more confident, and score an average of 20 points above the regular schooler. In this past decade we have also had many homeschoolers demonstrate this within the NCAA divisions. In fact, the NCAA has recently become very homeschool friendly incorporating a homeschool waiver that opens the door to approximately 75-100 students each year. The NCAA is an acrostic for The National Collegiate Athletic Association. This association was founded in 1906 and consists of 964 different schools in three separate divisions. Division I consists of the larger schools, division II the intermediate schools, and division III the smaller schools which typically don’t offer NCAA scholarships. The participating schools pay the NCAA to establish standards used in determining students academic eligibility. In turn the NCAA has partnered with ACT to operate a “clearninghouse” to explore and examine students academic achievements and ultimately their eligibility. Can Homeschoolers Qualify for NCAA scholarships? Homeschool sports is another area that in recent years has opened up to home educated students at an alarming rate. So, being on the ball isn’t just for the game, homeschoolers need to be vigilant when it comes to academics. Keeping good records, maintaining course descriptions and clear and precise homeschool transcripts is the best place to start. When to Begin Pursuing an NCAA Scholarship? It is advisable to begin the process of meeting NCAA eligibility requirements in the Junior year of high school. Once a student determines the colleges that they are interested in, they will need to contact them to get further information on requirements. Colleges differ widely on what they require from a homeschooler to finalize application and eligibility. It is also advisable to contact the financial aid office, get the necessary paperwork, and begin the process as soon as possible. The NCAA homeschool requirements themselves are pretty straight forward and typically require a solid transcript, completion of all state required core courses, and detailed course descriptions. 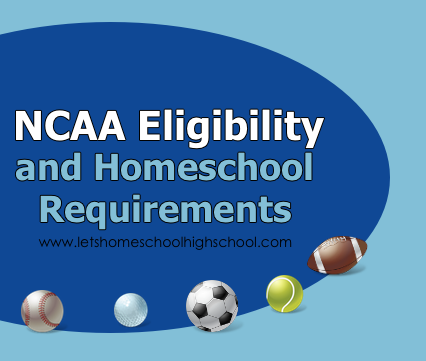 What Determines NCAA Eligibility for Homeschoolers? Typically schooled students wishing to apply for the NCAA athletic scholarship must be certified by the initial eligibility clearinghouse (ACT partnership) that they have met all requirements. However, homeschoolers though still being required to meet the eligibility standards must request that the institution of their choice (Division I or II school) submit an initial eligibility waiver to the NCAA scholarship association. Then the homeschooler will begin the standard requirement process. 3) Evidence that homeschooling was conducted in accordance with state laws. 4) A signed statement of who managed the homeschool program. 5) A list of textbooks used throughout the homeschooling process with ISBN or title and author. 7) Proof of high school graduation – month, day, and year. The NCAA has a wealth of resources for the homeschool athlete, just search “NCAA College-Bound Student-Athlete” and links to their various guidelines will be available. If you’ve worked with the NCAA before or had the experience of obtaining an NCAA homeschool athlete scholarship we would love to hear all about it! Please comment below and tell us about your experience or send us an email! "I filled out my "Core Course Worksheets" in detail using the examples that they gave as my guidelines. I didn't try to add anything extra, just did what they asked. My daughter took several classes through a homeschool co-op and so I gave my best estimate of how her work was evaluated by the co-op teacher." The NCAA makes it sound like courses taught by co-op teachers would not be considered "home school." We have done a combination of subjects that I have taught, co-op classes, and one public high school class. I also plan to have him do a dual-enrollment class his senior year, but it doesn't sound like the college classes are a problem. i have been home schooled since i was in second grade and now i am currently in my second year of high school. when i was still in school i was pushed ahead a grade, and now i have been accepted in to running start, a program where you finish the last two years of high school in college while you earn a two year AA degree. but even though my levels are all above where they should be, (besides math that is average) i didn't do any official program which means i don't have any verifiable document that says i have done my core subjects, and i self taught so i didn't have any one to grade me or supervise. i am worried that because i don't have the paperwork from those years that i wont be eligible for playing in college at the end of the running start program. any one know anything? We have a long NCAA story as well. I will try to condense. Six kids, all athletes. One of them graduated in 09, the same year my husband lost his job. She was All State, track and field, all state relay team, 4th in state heptathlon, without ever training for four out of the seven events. co-captain, recruited by a lot of colleges. Had a 3.31 GPA from home school, a high English portion of the SAT, and a low math SAT. She is NOT a math person. Got C's all along...but a stellar writer, and student otherwise. She also was a volunteer at a therapeutic horse riding center, dealing with children with disabilities. She passed the sliding scale for the NCAA....because of her GPA. We filled out all of the forms, took us hours upon hours to do that. Got into a couple of colleges, but the NCAA told her that she would not be able to compete because of her being home schooled and a math SAT score. So she entered a local community college, worked for a man that owned a gym and was a NCAA D -1 track coached and he trained her for competing unattached. She did well at the CC, had a 4.0 there. That she did for a year and a half. She stopped competing because of the expense, but kept up with her running. Then her coach from HS, Joanne Dow, and Olympic race walker, became head coach at SNHU. She knew our daughters abilities and especially her work ethic well. She had our daughter, Aria, Apply to SNHU. When they saw her transcripts, they were impressed. Aria has never thought of herself as smart, but she is a hard worker. They gave her a full scholarship, primarily for her grades. Here comes the almost funny part. She has a full ride to SNHU, a 4.0 at a local CC, a 3.8 her first semester at SNHU and they still don't allow her to run for the college. Does this make any sense at all? The sad thing in all of this is that this young lady, is just a really devoted athlete, student, friend, and 'kid.' She kills herself working. Meanwhile kids that are allowed to compete are partying every weekend, ( Aria didn't hate the athletes on her team she really liked them and never looked down on them) some could really care less about how well they do, and who really knows if their grades from their schools mean anything? But that is not challenged, by the NCAA, only the home school kid is challenged. So there is my long story. She finished up a year at SNHU, applied to The Masters College and got in there. It has been a long drawn out and tiring journey. She has lost so much time trying to appease these people. It is pretty sad, that she is being held back from what she loves to do. Not to mention in some ways it is a form of discrimination because people with a lot of money can afford to have their kids tutored. We could not afford that. Fast forward to today...she coaches HS track and field and loves it and the kids love her. It is an inner city school, and the kids just really respond positively to her way of coaching them. She runs a horse riding program at a christian camp in the summer, and loves that as well. I just think that most HS people with athletic kids don't know the difficulty in passing through the NCAA screening house. I can guarantee that if she were a football player in D-1, and in the same situation only taught at a public HS, this never would have happened, and it all boils down to money. 1) Wrote my transcript using the template on their website, making sure I included ISBN numbers with all my textbooks. I also made sure that at least one of the textbooks I used was a standard textbook, either a widely used homeschool curriculum or a book from a standard public school publisher. 2) I filled out my "Core Course Worksheets" in detail using the examples that they gave as my guidelines. I didn't try to add anything extra, just did what they asked. My daughter took several classes through a homeschool co-op and so I gave my best estimate of how her work was evaluated by the co-op teacher. 3) When setting up her high school curriculum, I made sure that she was completing courses that would meet the 16 core course requirements. As much as I would have like to have done some things differently, there is no wiggle room with those core courses and if playing sports in college is important, then that is the sacrifice you have to make. 4) I made sure that the grades on her transcript were realistic. I did a lot of "mastery" teaching, not letting my daughter progress on a subject until she knew the concept. But that doesn't make her a straight A student. The transcript grades need to reflect the real ability and align with SAT/ACT scores. My daughter wasn't enrolled an online school or another school during her high school years, so I really can't speak to the problems in some of the other comments listed here. My daughter was enrolled in dual enrollment college classes which were accepted as core course requirements with no problem. I was blessed to have several friends who had previously gone through the NCAA eligibility experience, and the one biggest piece of advice that I got and that I can pass on to you is "do exactly as they ask". This isn't the time or place to assert your homeschool independence, this is the time and place to conform. And if you have grey areas that aren't going to conform, make sure you are a member of HSLDA so you can have an advocate. My experience with a recruiting service was that they have no clue about homeschool requirements. I didn't use a recruiting service, but I did talk with one and I came away from that experience with the clear impression that the didn't know a thing about homeschool eligibility, and had I listened to what he said, my daughter wouldn't be playing soccer in college this fall. I will try not to be to long with my comment. So back in 2010 my eldest graduated through homeschooled from his sophomore year and dual enrolled at a Jr. His last two years. He had played football since he was in kindergarten and played well. He was on the D and O Line. So we made sure to follow all the guidelines and had a recruiter who obtain scholarships up the ying yang. He actually excepted a lower scholarship from a desired school of his choice VS a full ride from other ones. Basically after getting everything set up, T's crossed and I's dotted. The school informed us that he would be put on probation one year because of switching schools from 9th (public) to 10th (homeschool) and with out noticed started playing football for another school (homeschool national football team) so if he wanted to remain at his desired choice school he would have no scholarship at this time. He couldn't even walk on the field, speak to coaches or even work out in the gym with any players. So after the season was over we started once again to follow their rules. NCAA stated since the school was changing divisions from a 2 to a 1 all of his prior school work did qualify him but because of his probation period that they put him on was not allowed- for a possible D1 school . So he was not able to play. The coaches were not able to help or they would be dinged. We were not part of HSLDA at this time because he already was in a college for 6 months. So what happened next? My son after playing football all his life, quit this college and came home to enter the local 4year without a football team. We have spoken to other colleges (D3) just to get him back into football but the whole experience has ruined my son and the love, desire and drive of football is gone. Great article overview. I built a full summary page and links on this topic at the link below. I hope you readers find it useful. We too are having NCAA troubles. Daughter homeschooled through 9th grade, competitive swimmer, rules changed so she had to enroll in our local public school system to continue.swimming with the high school. She is being pursued by colleges to swim & we are trying to get through the NCAA process. Highschool is sending transcripts but NCAA has informed us that because of that freshman year we have to run everything through their homeschool department. I have spent the past two weeks trying to talk to someone in the homeschool department and cannot get a response or a call back. All i get is a voice mail. I have left clear messages with phone number & daughters registration number. No response. I will continue to send in what I see is required and will send registered mail that has to be signed for. I will also make copies. We also could not continue our HSLDA membership for daughter when she enrolled so have no representation. I think NCAA just gave "lip service" to HSLDA. One of the college assistant coaches has offered assistance with the process but we r trying not to make any commitment yet. Oh...such discouraging news yet again. I'm SO sorry that you have been basically "bullied" by the NCAA about your homeschool year. It sounds like the NCAA really needs to get their act together concerning homeschoolers. We may do a follow up article about this issue. I may touch base with you again if that happens. Thanks for sharing your experience with us. Wow, Keith. That is discouraging feedback on the NCAA. Once you have finished up with this experience (and hopefully gotten everything rectified!!) we would love to have you share your story with the site. Other homeschooling parents need to be aware of what they might be up against when trying to work with the NCAA. Any agency that has been so entrenched for so long in the "way things have always been" is not likely to accept change very readily. Homeschoolers present a "change" to the status quo for the NCAA and sadly, your daughter and others in this current homeschool-friendly environment will probably be the trailblazers and pioneers whose bumpy rides will pave the way for others by forcing the NCAA to re-evaluate their homeschool policies. I'm just sorry she is having to experience such frustration in the meantime. My daughter homed schooled two classes from her freshman year to her senior year. She took 3 classes at the high school and brought a credit up from junior high in Spanish. She has a full ride scholarship with UAA. However the scholarship is on hold because of NCAA rules in regard to homeschool. She has provided a high school transcript with diploma. She has been accepted at UAA as a student. However NCAA has not released her as ready to compete because they want logs in several of her homeschool classes. She participated in K12 home schooling. This program is excellent and far superior to the public high school education curriculum. We have contacted K12 program and they are diligently working to provide the required information to the NCAA. My daughter has started classes at UAA, with that said she has no books, and no food card, because the NCAA has not released her to compete. Why does seem that the NCAA scrutinizes, (almost discriminates) against homeschooled kids? Can you tell me if we belong to a homeschool co-op which provides transcripts, diploma, and is on NCAA school list, do we need to receive a release from potential colleges?